In 2018, especially after Facebook privacy abuses were revealed in the Cambridge Analytica scandal, many individuals began seeking alternatives. The #deletefacebook hashtag peaked around April 2018, and in some communities, this type of "why I'm leaving Facebook" announcements were popular. Mastodon is a distributed, federated social network with microblogging features similar to Twitter. "Federated" means that there is one app hosted in many places, so users can choose a host that meets their needs, but everyone can still talk to each other, similar to email. Near the peak of #deletefacebook, mastodon became trending as a twitter alternative with less nazis. Wil Wheaton famously moved to Mastodon from Twitter, but was ultimately disappointed by the experience, because while Mastodon's community is generally less toxic, it does not yet have the tools to handle the kind of targeted harassment that a celebrity might face. Microsoft has been buying up professional-themed social media platforms lately, such as LinkedIn and GitHub, intending to integrate them more fluidly with their enterprise software suite. 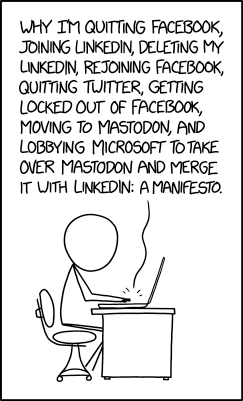 Mastodon seems an unlikely target for an acquisition, since its decentralized nature means that one corporate entity can't control it, and the culture there is decidedly unprofessional as of this comic. The title text presents an alternative approach by moving most social activities to the cloud-based proprietary team collaboration platform Slack. After making his first workspace in Slack he suggests that he wishes to avoid the people invited, so he creates a second account and a new workspace. This also didn't last long and he stops interacting on social media entirely and reverted to simple texting, probably sending old fashioned SMS-messages to others or just writing texts on paper no one reads. Why I'm Quitting Facebook, Joining LinkedIn, Deleting My LinkedIn, Rejoining Facebook, Quitting Twitter, Getting Locked Out of Facebook, Moving to Mastodon, and Lobbying Microsoft to Take Over Mastodon and Merge It With LinkedIn: A Manifesto. In the original version of this comic, Cueball misspelled "Mastodon" as "Mastadon". So, fundamentally, the title text suggests the same pattern as xkcd 2044. "I wish I could communicate with people more easily." "Ooh, this new technology makes it easy to create arbitrary social connections, connecting everyone." "Uh-oh, there too many people trying to talk to me, and there are bugs and privacy concerns"
This page was last edited on 22 September 2018, at 19:21.